Really? That's what I'm covering? I first saw this film (and last saw this film) at a drive-in, the summer after Ronald Reagan was elected president, because I guess they thought it would be funny. I was eight years old at the time, and it was the first I had learned our president was once an actor. It really blew my mind. 1951--BEDTIME FOR BONZO--A psych professor is trying to teach morals to a chimp as an experiment in nurture versus nature. Prof. Hans Neumann mentions seeing an invisible six-foot rabbit, who is clearly HARVEY!!!! 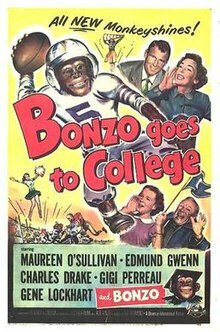 1952--BONZO GOES TO COLLEGE--Since the events of the last film, Bonzo has learned how to read, and ended up in a circus, where he escapes and is taken in by a college football coach. 1988 to 1991--SPITTING IMAGE--Bonzo, now deceased and stuffed, ends up in the possession of President Reagan.